Hung Up was fabulous at making a great first impression. I thought the format of the novel (phone conversations throughout the whole book) was really fun. Especially since the phone conversations initially started by accident but both the guy and girl just stayed in contact and sort of became like pen pals. I was so excited for their meet up especially with the build up towards it. Unfortunately half way through the novel I started to get very restless with the main female protagonist, Lucy. James, the guy on the end of the conversation was so nice and was always there for Lucy.. he opened up to her and actually cared about her. However for Lucy, I couldn't really say the same. She demanded James to tell her things that he would rather keep a secret (such as his broken relationship with his brother) but whenever he asked her the simplest questions, such as who her ex-boyfriend used to be, she would blow up at him and tell him it is none of his business and she isn't ready blah blah blah. I felt the relationship was one sided and I hated how Lucy was being a hypocrite by demanding to know so much about James but never telling him anything about her (they are from the same town/city). She seriously got on my nerves and I started caring less and less about their relationship. Still, the whole novel was funny, albeit lacking any emotional connection with the characters. Still, I had faith with the ending however it really disappointed me.. it cut off very abruptly and till now I wonder if I maybe have an uncompleted version? Because after all this build up, the author wouldn't deny us of their meet up right? especially when it cuts off when they are 3 feet away from each other? Anyways, I rated this book 3 stars because I enjoyed its format as well as how funny it was. It was a very fast read and it was a great break from the dark books I was reading. I don't know how to start with this book because I seriously have no feelings towards it. Great was such a weird book.. with the way the story progressed and the actual plot line. It is only 270 pages and almost 200 of those pages felt like a total filler for me. I was waiting for the actual point of the novel but I only really got there towards the end of the book when all hell and psychos broke loose. They are saying Great is a retelling of The Great Gatsby.. I was initially interested in checking out The Great Gatsby but I'm not sure I will right now because the storyline was seriously screwed up.. in a bad way. The main protagonist, Naomi is a child of divorced parents. Her mom lives in East Hampton ($$) while her dad is a high school coach. Every summer she spends it with her mom and this summer is no exception. She goes to East Hampton, meets Delilah and starts hanging out with her and Jeff, a guy who is interested in her. Then we've got Naomi's neighbor who seems to be creepily obsessed with Delilah, but for some reason everyone doesn't seem to notice it. We've also got Naomi's stereotypical homosexual friend, and literally every time she enters the picture we are reminded of that. Do we really need a reminder? I don't know why she didn't point out every time Jeff entered the picture that he is straight. I just don't get that. Also, I was not a fan of how everything went down the last 30 pages. There are 270 pages in this book.. why would the author do that? And Naomi.. Naomi was so annoyingly trustworthy and naive.. I disliked how she kept horrible secrets of people and wanted the bad person to redeem him/herself by confessing when we know that won't happen. Grr.. I really really disliked how everything was forced in this book.. from the 90210 luxurious life that we are always reminded of like "OOH this costs 5,000$, they are RICH" yes.. we get that.. the first 10 times it was mentioned to how all the characters seemed fake and stereotypical. I do not recommend this book to anyone. 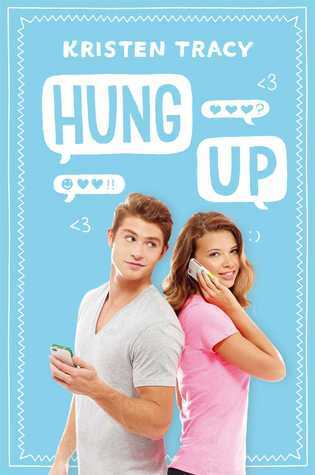 I'm looking forward to reading Hung Up so here's hoping your version is incomplete coz the ending sounds super annoying! As for Great, it sounds exactly how I felt after reading Gatsby. To me, nothing happened until the last 30 or so pages. It was just so damn boring. I'm not a fan of YA contemps but Hung Up looks okay. Too bad that Great turned out to be such a dud. I hope your next reads are much better. These look like great reads. It's the first time I'm coming across them so thanks for sharing. Fab reviews!